Several years of research and evidence have demonstrated that open source software portals often contain a large amount of software projects that simply do not evolve, developed by relatively small communities, struggling to attract a sustained number of contributors. These portals have started to increasingly act as a storage for abandoned projects, and researchers and practitioners should try and point out how to take advantage of such content. Similarly, other online content portals (like Wikipedia) could be harvested for valuable content. In this paper we argue that, even with differences in the requested expertise, many projects reliant on content and contributions by users undergo a similar evolution, and follow similar patterns: when a project fails to attract contributors, it appears to be not evolving, or abandoned. Far from a negative finding, even those projects could provide valuable content that should be harvested and identified based on common characteristics: by using the attributes of ‘usefulness’ and ‘modularity’ we isolate valuable content in both Wikipedia pages and open source software projects. 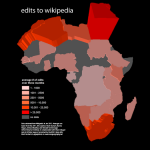 Copyright © 2012 John Wiley & Sons, Ltd.
Dear Sierra Leone, Liberia, and Benin: Have You Heard of Wikipedia?